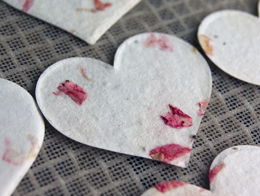 Wholesale Seed Papers and Hand Dyed Silks - Recycled Custom Seed Paper Made in the USA hand dyed silk ribbon manufacturer. Welcome 2019! We are starting the new year with a new web host and a new office manager! It was a busy end of the year and we look forward to many (much needed) updates to the site. Most importantly is the new minumum purchase requirement of $250. That is our opening order minumum.